Vinegar is a liquid consisting mainly of acetic acid (CH3COOH) and water. The acetic acid is produced by a process of fermentation of ethanol by acetic acid bacteria. Traditionally vinegar is made from a carbohydrate (fruit, grain, etc.) which can yield complex flavors, aromas, and colors. Commercial white vinegar, however, is basically a pure chemical. Alcoholic drinks come in many basic forms, each defined by its ingredients and methods of manufacture; the same processes can be adjusted to produce acetic acid rather than ethanol, yielding a variety of vinegars. Some of these are named for their analogous alcohol. Vinegar has a pH value of about 3. Vinegar has a density of approximately 0.96 g/mL. The density level depends on the acidity of the vinegar. Balsamic vinegar is an aromatic aged vinegar produced in the Modena and Reggio Emilia provinces of Italy. The original product—Traditional Balsamic Vinegar—is made from the concentrated juice, or must of white Trebbiano grapes. It is very dark brown in color and its flavor is rich, sweet, and complex, with the finest grades being the product of years of aging in a successive number of casks made of various types of wood (including oak, mulberry, chestnut, cherry, juniper, ash, and acacia). Originally an artisanal product available only to the Italian upper classes, balsamic vinegar became widely known and available around the world in the late 20th century. True balsamic is aged at least 12 years, and is protected under the European Protected Designation of Origin (PDO) system. One can sometimes even find balsamic vinegars that have been aged for up to 100 years, though they are usually very expensive. Balsamic has a high acid level, but the sweetness covers the tart flavor, making it very mellow. Malt vinegar is made by malting barley, causing the starch in the grain to turn to maltose. 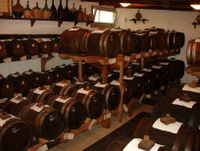 An ale is then brewed from the maltose and allowed to turn into vinegar, which is then aged. It is typically light brown in color. A cheaper alternative, called "non-brewed condiment," is a solution of 4-8% acetic acid colored with caramel (usually E150). There is also around 1-3% citric acid present. Rice vinegar is most popular in the cuisines of East and Southeast Asia. It is available in white (actually light yellow), red, and black variants. In Japanese cuisine, a light and more delicate rice vinegar is preferred for the preparation of sushi rice and salad dressings. Red rice vinegar is traditionally colored with red yeast rice, although some Chinese brands use artificial food coloring instead. Black rice vinegar (made with black glutinous rice) is most popular in China, although it is also produced in Japan (see East Asian black, below). It may be used as a substitute for balsamic vinegar, although its dark color and the fact that it is aged may be the only similarity between the two products. Some varieties of rice vinegar are sweetened or otherwise seasoned with spices or other added flavorings. White vinegar can be made by oxidizing a distilled alcohol. Alternatively, it may be nothing more than a solution of acetic acid and salt in water. Most commercial white vinegars are 5% acetic acid solutions, although some US states such as Virginia have laws prohibiting the sale as vinegar of any product not made from acetous fermentation of alcohol. These are made from alcoholic solutions fermented from cereals (often maize) and water. Wine vinegar is made from red or white wine, and is the most commonly used vinegar in Mediterranean countries and Central Europe. As with wine, there is a considerable range in quality. Better quality wine vinegars are matured in wood for up to two years and exhibit a complex, mellow flavor. Wine vinegar tends to have a lower acidity than that of white or cider vinegars. There are more expensive wine vinegars made from individual varieties of wine, such as Champagne, Sherry, or Pinot Grigio. ↑ http://jb.oxfordjournals.org/content/46/9/1217.extract vinegar Studies on acetic acid-bacteria Retrieved Oct. 21, 2011.